Pesto just got even better! I did not think that was possible, but this dish proves it is! Don't get me wrong, I love basil. But I may have found my new love in arugula pesto. If you follow me on Instagram (kelseyhunter), you may have seen that I was "testing" out the pesto a few days ago. Half a baguette later and dinner was on the table. You must try this pesto, whether you actually use it in a pasta dish or just eat it on its own. And if you have a minute, check out the step-by-step recipe feature that Gaby from What's Gaby Cooking did on the Tasty Kitchen blog yesterday. She made my Quinoa Salad with Roasted Tomatoes and Avocado. It was pretty cool to see that she had picked one of K&K Test Kitchen's recipes to make! Squeeze the water out of the arugula with your hands until very dry. Roughly chop the arugula and put in a blender. Add the garlic, salt and pepper to taste, and walnuts. Blend for at least 30 seconds. Add the olive oil and blend. Then, add the cheese and pulse to combine. The pesto will keep several days in a tightly sealed container in the refrigerator. Preheat the oven to 375F. Spray a glass baking dish with a bit of cooking spray or lightly coat with olive oil. Place the chicken in the dish and spread 1 to 2 tablespoons of pesto on top of each chicken breast. Bake for 30 minutes. While the chicken is cooking, bring a pot of generously salted water to boil. Cook your pasta until it is al dente. Drain and reserve 1/2 cup of cooking water. Put the pasta back into the pot, along with 1/2 cup (or more if you prefer) arugula pesto, sundried tomatoes, and the cooking water. Stir well to combine. Serve with the cooked and sliced pesto chicken. Reserve the rest of the pesto for dipping bread or as a spread for sandwiches. It's that time of the month again. Secret Recipe Club time! This month, I had Jocelyn's blog BruCrew Life. She claims that she has a sweet tooth and boy do I believe her! She has recipes for brownies, cupcakes, cookies, cheesecakes, donuts, you name it. My sweet tooth definitely went into overdrive as I explored her blog. I finally settled on these Take 5 Bars since Take 5s are one of my favorite kinds of candy. For my bars, I used mini Reeses instead of peanut butter chips. Most of the mini Reeses got eaten before I even made the bars... you know, since I had to make sure they weren't poisonous. I also thought that I had peanuts, so didn't pick any up ahead of making the bars, but I didn't end up having any. The bars were really delicious, but so rich. I had to drink a cup of coffee and a glass of milk to finish mine! I am definitely going to have to share these so that I don't eat them all myself. They definitely remind me of eating a Take 5 bar... except these are way better! Thanks for the recipe Jocelyn. Preheat oven to 350* Spray a 9x13 pan with baking spray (I used an 8x8 pan, so my bars ended up a little bit thicker). Set aside. Cream the butter and brown sugar until fluffy. Add the eggs, vanilla, and peanut butter and cream again. Slowly add the dry ingredients until it is all mixed in. Stir in the peanuts and peanut butter chips by hand. Spread the dough into the prepared pan and bake for 24 minutes. Cool on a wire rack. When completely cool, melt the chocolate chips and shortening in a microwave safe bowl. Stir every 30 seconds, so it doesn't burn. Lay the chopped pretzels on top of the cooled bars and spread the melted chocolate on top. Let set before cutting. So I am sure you can tell from the photo that today's post is from Kim and not Kelsey. We (me and her dad) really need to work on the photographs that we take for the blog! Sorry the photo does not do justice to the wonderful flavors of this grilled tenderloin. 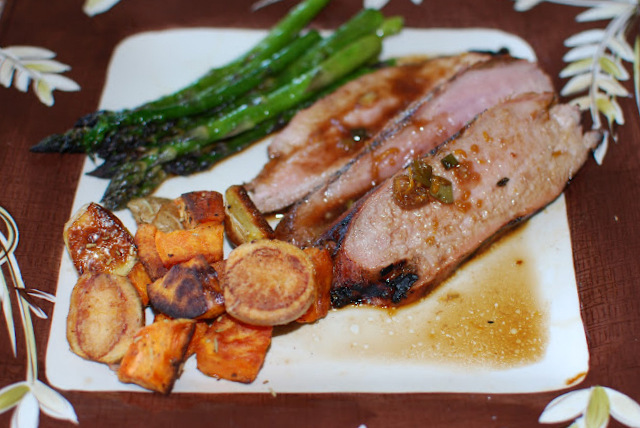 Grilling season finally hit Penticton last week as the weather reached the 70s and 80s, so I was thrilled to find a new recipe for pork tenderloin to use on the BBQ. No one is more excited by grilling season than me as my husband is a master barbecuer and I love having him take an active part in the meal preparation. I found this tasty recipe with an Asian flair on foodnetwork.com and I chose it as it was listed as easy, had a marinade/sauce and used simple ingredients that I had on hand. I did minimal tweaking and the pork was so tender and wonderfully delicious. Tim and I have deemed this one worthy of making again. Combine the soy sauce, sherry, honey, vinegar, oil, and orange juice in a medium bowl, whisking until well blended. Stir in the rosemary, shallots, and ginger. Pour the mixture over the tenderloins. Cover with plastic wrap and allow to marinate at room temperature for 2 hours. Preheat an outdoor grill or indoor grill pan. Remove the pork from the marinade, shaking off any excess. Place the tenderloins on the grill and cook, turning frequently, for about 18 minutes, or until an instant-read thermometer inserted into the thickest part reads 155 degrees F. Transfer to a platter and allow the meat to rest for 10 minutes before carving. Meanwhile, place the marinade in a small saucepan over medium heat and bring to a simmer. Simmer for 10 minutes, or until slightly thickened. Slice the pork into 1/4 inch-thick slices, spoon the hot marinade over the pork. So I thought that I would get some cooking in this weekend. It was a long weekend after all up here in Canada, but I spent all of my time having fun! Of course, I do think cooking is fun. But when it is 80 degrees out and sunny, it is hard to stay inside in the kitchen. We took in a Blue Jays game, I had a fun brunch with an old friend, and we had some nice walks outside. Overall a very lovely long weekend, but now I'm definitely behind on my recipes to post for you guys! In the meantime, I'll leave you guys with these delicious scones. The scones are from a recipe called "Bed and Breakfast Scones" and I could seriously imagine eating one of these warm from the oven at a quaint bed and breakfast with some butter and hot coffee. The dough isn't terribly sweet, so the focus really is on the fruit and you could definitely put any fruit in these scones. I really wanted to use apricots, but I was afraid they'd be a bit too tart. So to sweeten them up a bit, I cooked them slightly with some maple syrup first. I think next time I would add another apricot or two (so 4 or 5 instead of 3), but I was afraid that the dough would be too wet with all that fruit. I think it would be fine though! Start with the apricots: In a small saucepan, melt butter with maple syrup. Add the apricots and cook over medium-low heat for about 3 minutes (longer if your apricots aren't very ripe, mine were fairly ripe and I didn't want the pieces to be too mushy). Cool slightly. In a large bowl, mix flour, sugar, and baking powder together until well blended. Cut in butter, using a pastry blender or your fingers. Add the cooked apricot, distributing evenly. Mix egg and buttermilk together to equal 3/4 cup and blend into flour mixture, until evenly moistened, forming a soft dough. Do not overmix. Place dough in the center of a buttered baking sheet, patting into a circle about 1-inch thick and mounded slightly higher in center. Score into eight wedges. Bake in preheated oven for 15 to 20 minutes until edges are golden brown and top is lightly golden. *You can substitute one cup of any kind of fresh fruit for this recipe instead of using apricots. You may not need to precook the fruit. One of my favorite bloggers, Leah from Freutcake, has decided to share her tips on how she manages to stay bikini ready despite all of the delicious baked treats she posts on her blog. I have recently been asked the same thing: "How do I stay in shape despite all the food that I'm posting on the blog?" I have to admit that it is not easy. You've seen the posts from the last few weeks: ribs, New York Cheesecake, chili dogs. And you're probably wondering how I balance all that heavy food out. Well, the answer isn't terribly complicated. I do cook a lot of healthier food during the week and of course, I exercise. So, with summertime already here for some of us (not me), and shorts and bikini season upon us, I thought I should share some of my tips too. 1) Drinking a lot of water - we all know it's important, but for some reason we still don't drink enough. I aim for 2-3 of my 27 ounce water bottles during the work day. 2) Eating a real breakfast every morning! This too is so important, but I know there are people who skip breakfast. You will see a picture of my typical breakfast below: 2% plain Greek Yogurt, teaspoon of honey, dash of cinnamon, fresh berries, and a bit of granola (try this PB Granola or this Pumpkin Granola). Always try include protein in your breakfast. If you don't like Greek Yogurt (which has way more protein than regular yogurt), try this Breakfast Quinoa without the yogurt or these cute Zucchini Egg Cups. 3) Pack healthy snacks for mid-morning and afternoon: Greek Yogurt (snack sized), apples, and roasted unsalted almonds are my go-to. 4) Barre workouts (3-4 times a week)! I love my barre workouts at Inside Out Studios (in Ottawa). It took me a long time to find a workout that I actually liked and one that challenged and motivated me. Find what works for you, try out classes at your gym, go for walks or hikes with your girlfriends, join a running club or masters' swim team. Make it fun and it will be easier to stick to! 5) Walking to and from work everyday. It's a total of 4 kilometers and it helps me decompress from the work day. 6) Getting a complete source of nutrition (vitamins, minerals, and antioxidents) through Vemma. The anti-inflammatory mangosteen has also helped me recover faster between my workouts. I'm going to have my mom, Kim, share her recent journey as well next week. She and my dad have been in full body transformation mode (my dad has lost nearly 20 pounds) lately! To make sure that we all eat breakfast and have healthy, but also delicious snacks, I want to share these tasty little almond butter balls with you. This recipe is a mash-up of two recipes that I have pinned (or mentally bookmarked) recently, one from Eat.Live.Run and one from Bake Your Day. These little balls of goodness are so filling and super satisfying. They are a great grab and go snack or breakfast item. And the tiny bit of chocolate will leave both your sweet tooth and waistline happy. They are really easy to put together, no baking required, just a bit of time chilling in the fridge. But, the best part of these is that they are adaptable to your own tastes. You could switch the almond butter for peanut butter. You could add dried fruit or toasted coconut. The possibilities are endless, which means that you won't get board with these! And boredom is the worst thing for self-control when it comes to food. Cook your quinoa according to the directions (or use leftovers!). If there aren't directions: Dry quinoa should be cooked at a 2:1 ratio (so 1 cup of water per 1/2 cup of dry quinoa). Bring the water and quinoa to a boil, then turn the heat to low, cover, and cook for about 15 minutes. Fluff with a fork, then allow it to cool slightly. Mix the quinoa with the oats, cinnamon, salt, flax seeds, sunflower seeds, and chocolate chips. Pour the the honey, vanilla, and almond butter over the dry mixture. Mix everything together well then chill for 30-60 minutes. After you've chilled the mixture, roll it into small balls. Store in the refrigerator. Notice something different around here?!? Maybe the gorgeous new header, the pretty colors, the photo of K&K over there on the left? 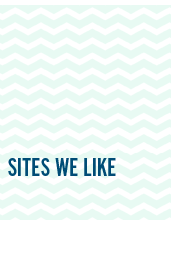 Yes, we got a makeover! The wonderful, talented Kelly of Fabulous K is behind all of the pretty that you see here. She seriously blew me away with her design and I couldn't be happier with her work! You should go check out her design services if you are in the market for that sort of thing or her blog if you like pretty things. Thank you Kelly!! To celebrate the pretty new blog, I made a bread salad. This salad is inspired by a few different recipes and by the lovely asparagus that is available right now. It is kind of cheating to eat a salad with bread in it, but this salad is just so delicious, especially since the bread sort of soaks up the dressing. A small plate of the salad was very filling and satisfying. I didn't mix together the whole salad since it was just me eating it, and I didn't want the dressing to make everything soggy for my lunch. I'm pretty excited about these leftovers though, even if it means having to carry a few different containers with me on my walk to work. What do you usually bring for lunch? Am I a crazy lady for trying to assemble a salad like this? Heat a tablespoon of olive oil in a medium skillet over medium-high heat. Rub another tablespoon of olive oil onto the flat side of the chicken thighs, then season with salt and pepper. Place the chicken thighs, flat side down in the skillet. Cook them for about 5 minutes, then turn the heat down to medium and cook for another 10 minutes, then flip and cook another 5 minutes. Snap the ends off the asparagus. In a glass baking dish, toss the asparagus with one tablespoon olive oil, juice from 1/4 lemon, salt and pepper. Put the asparagus in the oven with the toasting bread and roast for 15 minutes. Cut the baguette into slices, then in half. Toss the bread pieces with 2 tablespoons olive oil and minced garlic. Arrange the bread on a baking sheet and toast it in the oven for about 5-7 minutes per side. Whisk together the dressing ingredients. You can add a bit more vinegar if you prefer a more acidic dressing. To assemble the salad, mix together bread, arugula, warm asparagus (cut in half), and tomato wedges. You can also cut the chicken into chunks and mix it in as well, or you can place the chicken on top of each serving. Pour the dressing over the salad and toss to combine. 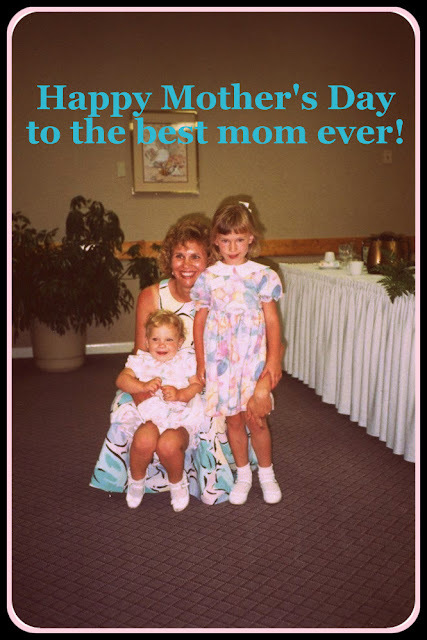 I'm pretty lucky to share this blog with my mom. She's amazing in every way! As Kelsey mentioned on our 300th blog posting, my husband Tim and I celebrated our 31st anniversary this week. Can you just imagine what it is like for my dear husband to have to eat my cooking for all that time? I am sure he would tell you that participating in K and K Test Kitchen has added a good variety to my home cooking. So, I would also like to thank our followers for your support and encouragement, and for giving Kelsey and I a reason to continue our food blogging. To prepare the chicken, first combine ½ cup Cilantro Lime Dressing and the limejuice in a bowl. 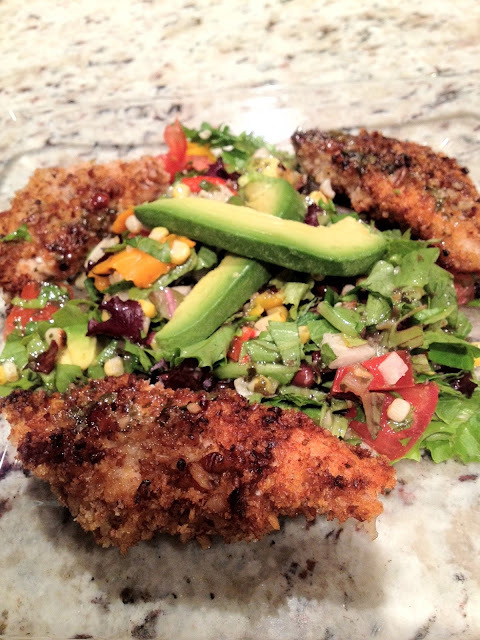 Combine the Panko crumbs, pecans and lime zest on a flat plate. Dip the chicken pieces in the dressing and lime mixture, then dip in the panko mixture. Heat 1 inch of olive oil in a large skillet over medium high heat; cook the chicken tenders in batch for 3 or 4 minutes per side. Drain on paper towels. Combine salad ingredients together and toss with Stonewall Kitchen Cilantro Lime Dressing. Top with the Lime Cilantro Pecan Chicken Tenders. This recipe had a hearty dinner salad for two with leftovers for lunch! An alternative to using Stonewall Kitchen’s dressing is to make your own dressing and the next time that I make this salad, I am going to try the dressing below and double it to get enough for dipping the chicken tenders. Place the jalapeño pepper, garlic, and ginger in a food processor or blender; pulse until finely chopped. Pour in the lime juice, honey, balsamic vinegar, salt, and cilantro leaves and pulse a few times to blend. Turn on the processor or blender, slowly add the olive oil until incorporated into the dressing. There are a few more recipes to share from the Foodbuzz 24x24: Playoff Hockey Party. At this rate, the playoffs may be over by the time I get them all to you! Are you watching the NHL playoffs at all? Or maybe the NBA playoffs? Or could you care less about sports? Well, whether you are a sports fan or not, I think we can all appreciate a good chili cheese dog (okay maybe not the vegetarians). These chili cheese dogs are quite delicious. And can you believe that they were the first chili dogs that I had ever had?? I think I'm hooked. The chili was awesome; it was just meat, no beans, and slightly sweet from the honey. I only wish that I had a BBQ to grill the dogs! Thanks to my hand model! Soon I will bring you homemade ketchup and relish recipes, in case you don't love chili dogs. Once the beef is well browned, add the tomato sauce, molasses and beef broth. Add all the spices except the cayenne and stir well. Bring to a simmer and taste. Add salt or the cayenne if it needs it. You can of course add much more cayenne or chili powder if you like things really spicy, but it’s best to taste first and then add more. Let the chili cook on a gentle simmer for at least 30 minutes before you start grilling the hot dogs. You can cook it several hours if you want to, adding a little more beef broth here and there if the chili gets to dry. Cook your hot dogs. The recipe suggests that you grill your hot dogs over medium heat until they get a light char. I boiled our hot dogs, which is kind of boring, but it's what happens without a grill and when you've never cooked a hot dog before! Dog goes in bun, chili goes on top, sprinkle on chopped red onion and shredded cheese, and have at it! It is hard to believe that this is the 300th post on K&K Test Kitchen. This blog is a little over 2 years old and it amazes me every day how far we've come! It has been a lot of fun learning about blogging, and cooking for that matter. When I first hit publish on the very first post, I don't think that I ever imagined that one day I would hit publish on post #300. A huge thank you to all of you for reading K&K Test Kitchen! Now, I promised that today's post would be a little bit sappy. So here it goes. As much as I appreciate the support of all you lovely readers, I really want to thank my family for all their support - their support of the blog, but mostly their support for me. I am so incredibly lucky to have the family that I have! 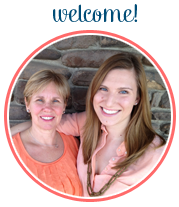 A big thanks to my mom, Kim, for her participation in the blog and for letting me take her along on this journey. She's always been my biggest fan and supported me through thick and thin. And a big thanks to my dad for teaching me everything I know about hard work and perseverance. Those values have definitely helped me stick with the blog and keep pushing myself in all my endeavors. And thanks to my sister, grandma, aunts, uncles, and cousins for all of your support and encouragement too. They are all wonderful and lovely people. This week is both Mother's Day and my parents anniversary. Both days celebrate how awesome my parents are. I love you both so much!! Thanks for helping me become the person that I am today! Okay, I know you really came here for the cheesecake. Sorry for the rambling. It's difficult to figure out how much of myself to put out there on the blog, so hopefully you'll keep coming back despite this long winded post! The cheesecake is definitely the star of today's show (and the Foodbuzz 24x24 party that I hosted). This cheesecake is sinfully decadent. No cutting corners on this one (well sort of, I did use a little bit of light cream cheese). It is perfectly creamy, with a tangy topping and crunchy, buttery crust. It definitely renewed my love of cheesecake and it was so easy to make! New York Cheesecake: Grease, or spray with Pam, a 9 inch springform pan. Place the springform pan on a larger baking pan to catch any leakage while the cheesecake is baking. Preheat oven to 350°F with rack in center of oven. For the crust: In a medium sized bowl combine the graham cracker crumbs, sugar, and melted butter. Press the crumbs evenly over the bottom and about 1 inch up the sides of the springform pan. Cover and refrigerate while you make the filling. For the filling: In bowl of your electric mixer place the cream cheese, sugar, and flour. Beat on medium speed until smooth (about 2 minutes), scraping down the bowl as needed. Add the eggs, one at a time, beating well (about 30 seconds) after each addition. Scrape down the sides of the bowl. Add the whipping cream, lemon zest, vanilla extract and beat until incorporated. Remove the crust from the refrigerator and pour in the filling. Place the cheesecake pan on a larger baking pan and place in the oven. Bake for 15 minutes and then lower the oven temperature to 250°F and continue to bake for about another 60 - 90 minutes or until firm and only the center of the cheesecake looks a little wet and wobbly. (The baking time can vary due to the differences in ovens, so make sure to check that the cheesecake is firm with only the center being a little wet and wobbly.) Remove from oven and place on a wire rack. In a small bowl combine the sour cream, sugar, and vanilla extract. Spread the topping over the warm cheesecake and return to oven to bake for 15 more minutes. Remove from oven and carefully run a knife or spatula around the inside edge of pan to loosen the cheesecake (helps prevent the surface from cracking as it cools). *We will do a post on Vemma eventually, but in case you want more info, visit my mom's site. Apparently, today's post is the 299th post on K&K Test Kitchen! Monday will be #300 and I'm practically in shock. This blog has been such an adventure and I am so amazingly grateful that you have all been a part of this journey. Okay, enough sap for today. I'm saving the rest for Monday's post. Now, we will drool over ribs. These oven-baked St. Louis Style Ribs are so good. The BBQ sauce is perfection and they become so tender. This was my first time making ribs and I can't believe that I waited so long to make them. The ribs were part of my Foodbuzz 24x24: Playoff Hockey Party and I almost missed out on eating them because they disappeared so quickly! Thanks to N for his help making these! I did some searching and I learned that St. Louis Style Ribs are made with spare ribs rather than back ribs. Spare ribs are a bit longer and usually fattier (aka tastier) than back ribs. It is important to look for ribs with even fat marbling throughout and to avoid ribs that have large fat deposits. For the ribs, I made the BBQ sauce, which was quite easy and so tasty. However, you could use your favorite sauce instead. In fact, we ended up adding a bit of Diana's BBQ Sauce, our favorite brand, because we wanted the ribs to be saucy. And because tomorrow is both the Kentucky Derby and Cinco de Mayo, head on over to Pinterest to see the inspiration board that I put together! Stir all of the sauce ingredients together in a medium saucepan. Bring to a boil. Allow to boil for about 15 minute stirring occasionally. Simmer the sauce uncovered, until it reduces to the desired thickness. I let the sauce simmer for about 20-30 minutes (then I let it cool and stored it in a glass container in the fridge until I was ready to use it). Preheat oven to 350°F when you are ready to cook the ribs. Cut ribs into serving sizes. We cut ours into individual ribs. Place in greased roasting pan or casserole dish (grease it well!!). Sprinkle the ribs with garlic salt. Bake uncovered for 45 minutes bone side up. Drain the grease off the ribs. Pour the sauce over the ribs. Cover with aluminum foil and bake for 1 hour (We didn't cover ours right away, and that's why they got a bit crispy). Uncover and bake for an additional 30 minutes, basting the ribs 2-3 times during final stage.